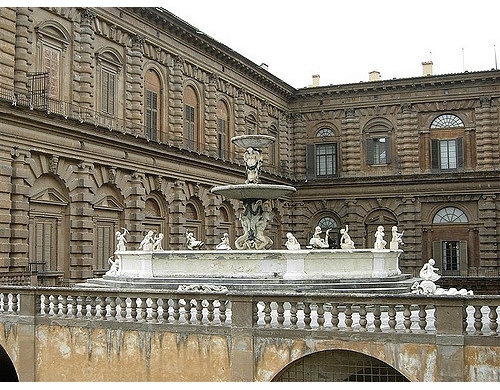 The history of Palazzo Pitti is fundamentally tied to the royal dynasties. Over the course of many centuries, it has in fact hosted three noble families: the Medici, the Lorena and finally the Savoy. The name of the palazzo derives from the Pitti family, precisely from Luca Pitti, who in the 15th century was a great rival of the hated Medicis. History tells us that the Medici family, led by Cosimo the Elder (il Vecchio), wanted to build a private palace and assigned the work to the architect Brunelleschi. Brunelleschi delivered a project so lavish however, that it was rejected by Cosimo the Elder, who preferred the more sober project of Michelozzo (which is the current Palazzo Medici Riccardi). Luca Pitti, wanting to build a residence larger than that of the Medici, decided to contact Brunelleschi (or his pupil Luca Fancelli) himself and asked him to construct for his own family the magnificent and lavish building which was rejected by the Medici. And that was how construction began in 1440 on the largest private building in Florence: Palazzo Pitti. Luca Pitti wanted to construct a palace that was so large that every one of its windows was as large as the main door of the Palazzo Medici Riccardi; so large in fact that it could host in its courtyard the entire building of the enemy family. Unfortunately for the Pitti family, this dream was halted in 1464 when construction was stopped after economic ruin hit the family. The same thing would happen in the following years to the Strozzi family and Palazzo Strozzi. 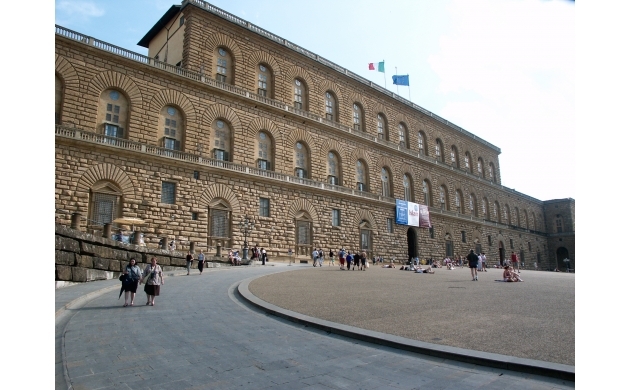 Nearly 100 years later, in 1550, Palazzo Pitti was acquired by Eleonora di Toledo, wife of Cosimo I de Medici and daughter of the viceroy of Naples. The duchess was looking for a healthier locale for herself and her children, away from the city life of the Palazzo Vecchio, which was at that time the residence of the ruling family. 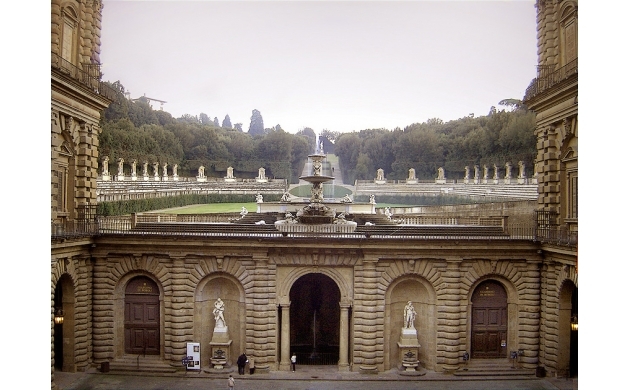 Under the Medicis, Palazzo Pitti was greatly enlarged, doubling in size from the original. The building was also flanked by the Boboli Garden (which is found at the back of the Palazzo) and by the Vasari corridor which connects Palazzo Pitti with Palazzo Vecchio. From this fortunate occasion began a rebirth of the Oltrarno neighborhood, which saw the arrival of numerous noble families who settled themselves in the area surrounding Palazzo Pitti. The original project for the building envisioned a construction based on a ground floor and then two further stories above, with only five windows for each floor. Palazzo Pitti is enclosed by walls on only three sides, with the back facing the Boboli Garden. The real novelty of this construction, however, is represented by the large piazza in front, a real innovation for this time period when private houses did not have any external courtyards. 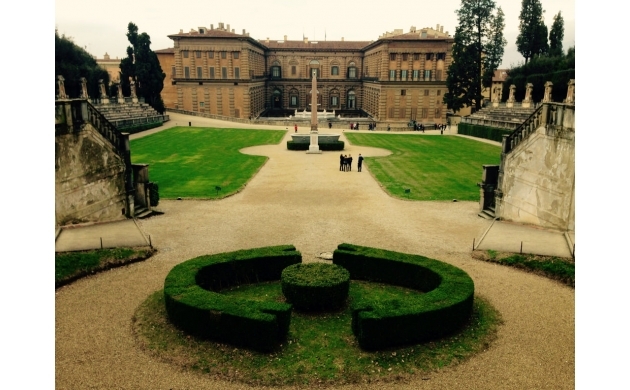 Palazzo Pitti (along with the Boboli Garden) is in reality a great container of museums. Inside are found the Galleria Palatina, the Galleria d'arte Moderna, the Royal Apartments, the Museo degli Argenti, the Contini-Bonacossi Collection, the Museo delle Porcellane and the Museo del Costume (the last two being found inside the Boboli Garden). But the Palazzo alone, with its many frescoes and its sculptures, is an infinite wonderland ready to be explored.